Tiki’s 10th Anniversary Celebration yields $7500 for Aloha United Way! Mahalo to everyone who came to Tiki’s to help us celebrate our 10th Anniversary on Wednesday October 17th! A great time was had by all as we enjoyed Chef Ronnie’s outstanding food and toasted the last ten years as well as the years ahead. Vaihi and Sonny Kapu provided the entertainment during the festivities. Tickets were presold in advance and and at the door, and with a final cash contribution from Tiki’s, $7,500 was raised for Aloha United Way. 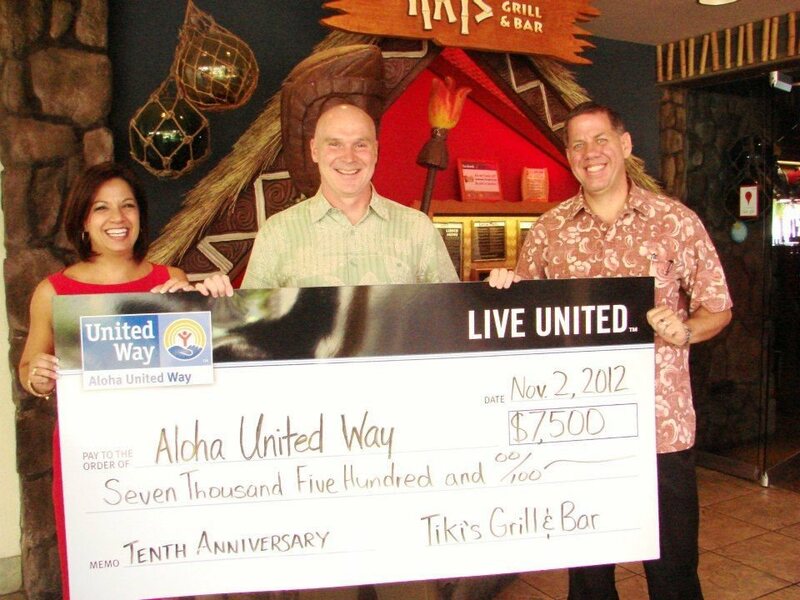 When Tiki’s Grill & Bar opened on October 17th, 2002, we help a Grand Opening Party as a benefit to Aloha United Way. At that time, September 11, 2001 was still fresh on the minds of many, and the United Way’s support of our community was an essential safety net seen first hand by many in the visitor industry. For several days after the terrorist attacks, the beaches in Waikiki were nearly empty, vacations for many were put on hold, and worry consumed most of us. Like the many years before 9/11 and the years since, Aloha United Way has been a cornerstone of our islands and our ability to help each other and rise above the diversity of life.